What being All-In means at AppsFlyer, and how it became a core part of our culture. The most interesting thing I learned here at AppsFlyer is how a change in perspective and mindset can yield outstanding results, for both the company as a whole and mainly for individual team members. Below is an email I sent the AppsFlyer team in early 2015, explaining what being All-In means to me. It has since become a core part of our company culture. 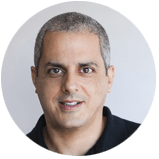 Since the company’s inception, and especially in the last 2 years, my main mission as CEO was to hire the best team and build the ultimate company culture and DNA. I understood early on that this is both a critical and irreversible process of creating an outstanding company culture. I believe it’s the single most crucial element for every growing company’s success. As you probably noticed, I occasionally use the term “All-In”. In Poker it means that you bet everything you have on one hand. Similarly, if time is the most valuable thing for all of us, when you select a company to work for, you go “All-In” automatically. It means that if you are not 100% committed and driven, you are assuming all the risk but not the reward. Think about a Poker “All-In” move in which you simply leave your money on the table and go. In some cases, you can go “All-In” with a weak hand. It means that there is a very low chance that you can make an impact with your amazing capabilities and/or potential. In Poker, double aces have the best odds pre-flop . I can assure you that you’re all holding double aces in your hand, and it is your job to play them wisely. I am really excited to see how the team members are growing and developing their capabilities and skills to new heights every day, myself included. There is one major difference from the aforementioned poker analogy. Poker is a zero sum game. AppsFlyer is a team effort, making it a positive sum game. The outcome potential for all of us is huge. It is what we make of it. When we founded AppsFlyer, I was obsessed with our challenges, ideas, options, learning, imagining, analyzing, dreaming and executing relentlessly. That focus was the main thing that allowed me to grow professionally at a very rapid pace. I wasn’t distracted by recruiters trying to hire me, my title, office politics, ego or any other random distractions. As a founder, I had to make sure my mind was 100% focused on the company. While it was obviously great for AppsFlyer, the most interesting outcome was my own long-term professional growth. This All-In focus, allowed me to grow into the CEO I am today, and continue to serve the company I started all those years ago, as we near our next exciting milestone of 500 employees and celebrate reaching 100M USD ARR. I always get asked if experiencing such incredible personal and professional growth as a result of being All-In is unique to founders. In fact, it’s not about being a founder, but rather about shifting your view, thinking and acting like a founder, and embracing All-In as a state of mind. There are many AppsFlyer employees who during their time at AppsFlyer, soared to heights they couldn’t have imagined when they first started. The common thread between these individuals is that they all are All-In. Nothing makes me prouder than seeing them grow and excel every day. When a team member tells me that they’ve woken up with an amazing feature or business idea, I know that they are on the All-In highway, and en route to extreme personal and professional growth. Is All-In all you need to be successful? No. 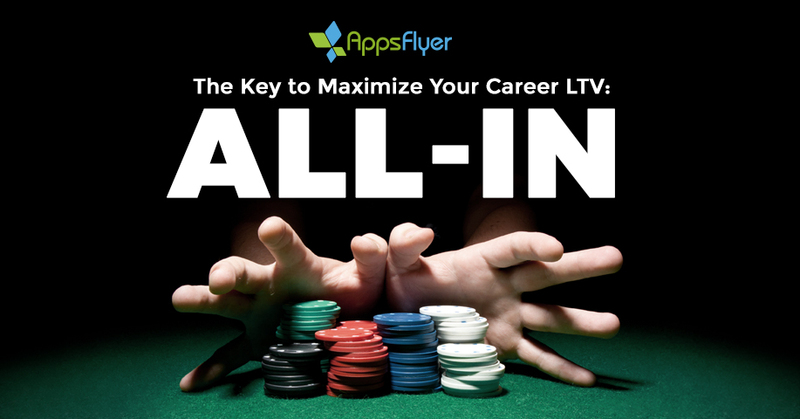 While it is crucial to go All-In in every position you fill, the macro conditions (your cards) are out of your and your company control and might limit your success. Such conditions include: market, product/market fit, company culture, etc. At AppsFlyer, we are fortunate to have great macro conditions lined up: clients, partners, a mission-critical product, team, great investors, culture, and operating as a market leader in a fast-growing mobile and marketing cloud market. As a Customer Obsessed company, we must first be Employee Obsessed. We need to make sure that we provide the team with the tools and resources they need to go All-In. In fact, we have a dedicated People Operations department with exactly that mission in mind. It’s also what propelled us to create some of the more unique AppsFlyer benefits, such as GeeP, our Global Employee Exchange Program. Being All-In helps in figuring out what’s next for you. By being All-In, you not only develop yourself to the max, you also have more information about the market you’re in, the people around you, the company you work for and yourself. It will allow you to optimize your long-term Career Lifetime Value (C-LTV) instead of focusing on short-term targets, such as your Linkedin title ‘SEO’. When you’re All-In, the only parameter is your abilities and how you choose to develop them. For example, many people see managing a team as a short-term target. The way I see it, All-In individuals don’t require hierarchy to make an impact and lead others. In fact, in today’s workplace, managers can’t rely on their authority to manage a team. They must be good leaders and lead by example, regardless of their title and position. All team members should strive to develop their leadership skills to make an impact and be a positive influence on others around them regardless of hierarchy. Think back on your first few days at a new company. No one walked around with their titles pinned to their chests, yet you could immediately ‘sense’ the leaders in the room. Do I have to sacrifice my personal life to be All-In? Not really. At AppsFlyer, we believe that success is never accidental and comes from a lot of hard work. We also believe that harmony between the personal and the professional allows people to be at their best in all aspects of their life. This is one of the reasons we established our learning & development department to help employees learn, evolve, develop and find more things they love and are passionate about. All-In is about focus, always considering the company’s interests while thinking and acting as if you yourself are the founder. Thankfully, I still find the time to interview most of our new employees. In most cases, I meet people who don’t realize the power they could have in their current positions. They don’t really need the company to promote them, as they have everything they need to promote themselves by changing their mindset. It is the All-In attitude that will open the door for them, not changing the cards (job) every year. Whether you realize it or not, you can be All-In right now, the question is whether you decide to play your hand or not. My number one career advice to anyone, is to make the most of the hand you’re dealt, but keep in mind you get to choose the cards yourself, to a certain extent. Do your research, focus on companies/industries that are a good fit for you, and go All-In. At the end of the day, the main benefit in working for any company is the experiences you gain from it. And it’s not the salary or the title, but rather being ALL-In which will allow you to get the most out of it. It costs nothing, and is 100% Tax-free. Good luck!